The PackshotCreator expertise allows the famous European flash sales website Bazarchic.com to improve its creation process and decrease the costs related to photography. 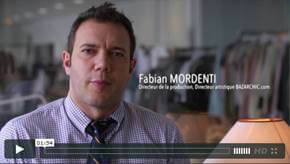 Fabian Mordenti, Production Manager and Artistic Director of Bazarchic.com, explains how Bazarchic.com, specialized in luxury flash sales, has optimized its photo studios by integrating the new generation of the PackshotCreator equipment. Six to seven brand sales in various sectors such as fashion, jewelry, home decoration, accessories, present hundreds of different products every day. The success of Bazarchic.com comes from the internalization of the photo studios that handle many product shootings. « In order to shoot so many items with the same level of high quality, we have been using since 2009 the PackshotCreator equipments. They are particularly adapted to our needs to shoot jewelry, watches, bags, shoes, clothes, create multi-angle shootings and 360° animations ». In May 2013, Bazarchic.com equipped its photo studio with 3 new PackshotCreator systems. This new generation of solutions for the creation of still or animated pictures has offered a significant gain in productivity in the workflow. http://www.packshot-creator.com/the-blog-packshot/bazarchic-client-packshotcreator or scan our QR code. PackshotCreator is the leader of solutions for product photos and animations for e-commerce and marketing. Our range of 26 equipments and 6 softwares offers a wide response to the needs and concerns from several sectors as fashion, jewelry, electronics, furniture, foods, decoration… PackshotCreator helps companies to make their online shops more attractive and more profitable and their communication more interactive. Bazarchic.com is the first flash sales website dedicated to luxury and designer items. The firm’s philosophy is an art lifestyle very « French touchy », or how to enjoy shopping without spending too much money! Bazarchic.com offers event sales with 70% off discounts, showcasing 800 collections from well-known French and international brands. With 4 million members and a 60 thousand euro turnover, Bazarchic offers sales in various sectors such as fashion, jewelry, home decoration, accessories, cosmetics, high-tech… Bazarchic.com aims at discovering new trends, new designers to meet customers’ needs and expectations.